Gigabit LAN has really taken off even though affordable Gigabit switches, hubs, and home/office networking gear are not that readily available. By next year the situation may be drastically different, so it's good to find a motherboard which is prepared for future standards. Curiously, Epox did not license Intel's CSA technology for the 4PDA2+ GbE connection, and decided rather to select a PCI-bus based Broadcom BCM5705WKFB Gigabit LAN controller. Opting against CSA makes sense when the bottom line is important, but we're left wondering if that's a good idea. If you were to run the USB 2.0/IEEE 1394 at full speeds while using the onboard Serial ATA and Ultra/133 IDE controllers, and also run the Gigabit LAN all at the same time the PCI bus could become saturated very quickly. To help make things easier on the end user, the Epox 4PDA2+ comes bundled with two purple coloured rounded IDE cables. 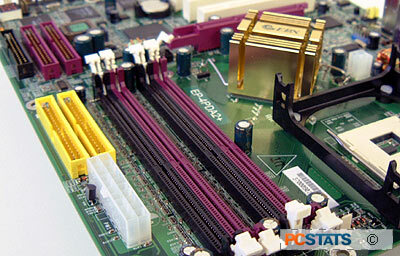 This certainly help make cable management easier, and that can improve airflow in the system. I have yet to see an external Serial ATA device but I guess they must exist, or are comming out as many manufacturers are including brackets for external Serial ATA devices. To help keep make things easier for the consumer Epox places all the headers/ports on the edge of the PCB, this helps keeps cables from interfering with the other system devices (like that $500 videocard). The only real annoyance on the Epox 4PDA2+ stems from the CMOS jumper. Unfortunately, it's difficult to reach the clear CMOS jumper with the two GSC 6.3V 1500 microfarad capacitors, the two Serial ATA ports, and an Ultra/133 IDE port surrounding it.